The circular economy is coming in hot and sure as oxygen, we love it. Have you ever lost a hair tie and thought, "wow, what a huge consumption of energy to produce one tiny, impossible to keep track of item!"? Or, visited the store horrified by the plastic, elastic, not-so-fantastic range of bands, pins and ties for sale? ..Only to be misplaced and subsequently strangle a baby seahorse. Hair seems to grow fast at VOPO HQ and we suffer a serious case of missing hair tie syndrome, so you can imagine our amazement when we discovered a solution that tamed our salt simmered manes, whilst actually doing something beneficial for the world that echoes beyond pig tales. Introducing SAYA, turning heads for all the right reasons. Inspired by nature, these beautiful (and highly practical) hair pieces are designed by artist and founder, Victoria who takes inspiration from the local flora and fauna of Indonesia. "The roots are left behind by loggers harvesting trees on large-scale production sites. They take hundreds of years to decompose and have little value for the soil. By using this waste material we are having as little impact on the environment as possible." The designs are then handmade using traditional techniques by Balinese artisans who gain skills and income through the initiative. 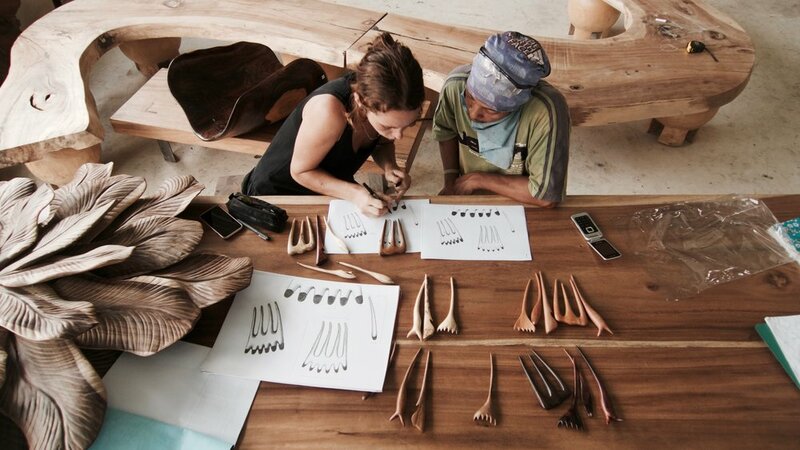 Fuelled by their commitment to the environment, SAYA additionally works in partnership with GAIA foundation, where each hairpin funds up to ten endangered tree species being planted in rainforests across Indonesia. So far, 1558 trees have been planted! This enterprise exists to empower people, make a dent in consumer behaviour, while supporting measures for reforestation. Quite elegantly, the hairpin acts as a trojan horse, opening up critical conversations around Indonesian forestry practices, which leave much to be desired and numerous opportunities for change. Learn more and support SAYA. Photography by JAX Oliver Studio on VOPO Expedition, The Philippines 2017.